Christmas is exactly one week from today, can you believe that?! Oy vey, time is going by way too fast (I say this all the time, I know)! Today's pairing will hopefully give you an outfit idea to wear to a holiday party. I tend to embrace plaid and tartan more come the holiday season, specifically those that feature red, as they have a nice festive vibe to them. What I love most about these prints is that they go well with an array of fabrics and other prints. I love how they look with either leopard or houndstooth, when creating a nice pattern mixed look. I had to fight the strong urge of not wearing my leopard coat with this dress because I've already featured a couple of pairings in recent weeks with my leopard blazer, and so I didn't want to go too crazy with my favorite print and wanted to bring some new inspiration to all of you. As you can see, I opted for a black sequin blazer, but I also love the idea of either faux fur or velvet; all of which create a lovely festive feel, perfect for attending a holiday party! Now, if you don't have a tartan or plaid dress, no worries! You can still recreate this look by using a plaid shirt and sequin or velvet skirt. 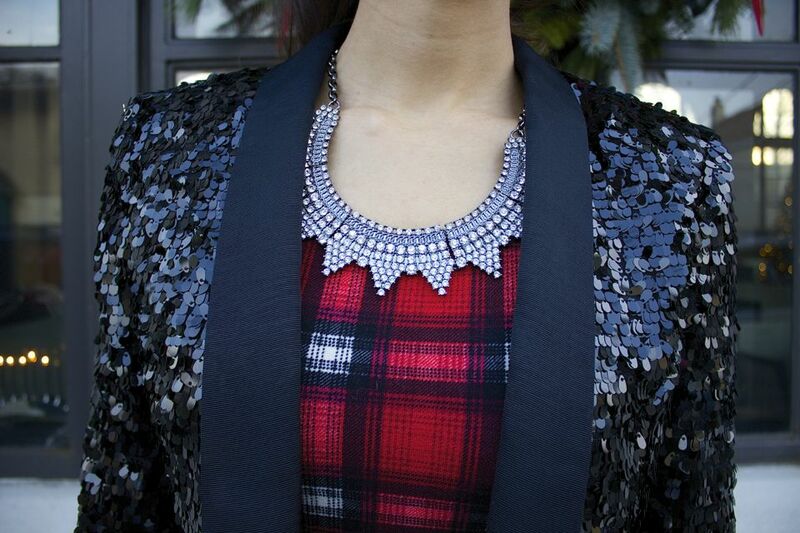 If you have a plaid skirt, you could opt for a sequin or embellished blouse, there are so many possibilities! What do you think of the look? I hope you like it enough to try out yourselves! What is your favorite print or fabric to wear most during the holiday season?! I hope you have an amazing weekend, my beautiful friends, and thanks so much for stopping by! Next: Golden Green Previous: Free Samples?! Somebody PINCHme!